A PERFECT INTRO to Astronomy! Kids will get a front-row seat in a planetarium-style star tour presentation to help them understand galaxies, black holes, and why Pluto was crossed off our planet list. Astronomers study celestial objects (stars, planets, moon, asteroids, comets, galaxies, etc) that exist outside our planet's atmosphere. Its the one field that combines most science, engineering and technology areas in one fell swoop. Astronomy is also one of the oldest sciences on the planet. This topic is presented in a non-evolution, non-creation way so all families may participate.The videos give you step-by-step instructions for doing each experiment. **this is an affiliate link for a company that I am using for my own children's studies and have since 2012. I HIGHLY recommend her products to anyone who will listen to me! ENJOY this QUALITY FREE RESOURCE! Lapbook: A lapbook is simply a file folder that contains a variety of "mini books," foldables, and other material that cover detailed information about the lapbook's central topic. Notebook:﻿ A homeschooling activity where (usually older) homeschoolers catalog what they are learning in writing and pictures and inserting them into binders. Interactive Notebooking is often used in public school settings and is a combination of these two forms of recorded learning. We use the interactive notebooking because my children would rather be experimenting with the materials than recording information. I often use a lapbook piece and require that they record basic information then glue it into their notebook. I use photos and videos as additional learning records. Tell Us Your Favorite Resource! Share your home school blog or ask a question! Follow me on Pinterest. Between me and the kids we have 3000 links to quality resources for creative home schooling! Follow Julie's board Science Astronomy on Pinterest. This is a great site, but what I really like about it, is that it has an interactive star map so you can input your location, and the date and get a map of what you can see up in the sky. With that said, take your map and go outside at night and see what you can find! Below is a partial list from Cross and Quill Media (www.crossandquillmedia.com) and their Facebook page - Christian Homeschooling with Netflix, Amazon, You Tube, Roku and MORE! 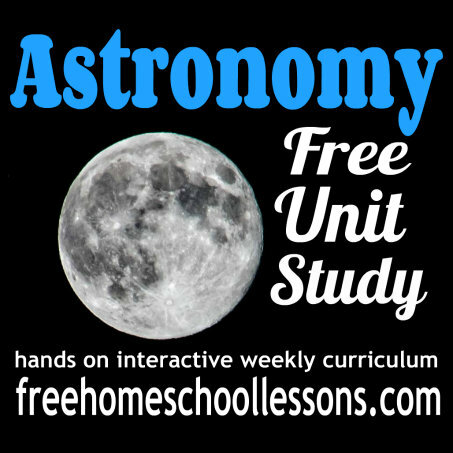 1st Grade Lesson Plans (9 lessons) complete unit study Written by 2 First Grade teachers in Elizabeth Colorado, this Solar System lesson plan contains almost everything needed to teach your child in 9 easy lessons!